Every year 29th September is celebrated as World Heart Day. World Heart Federation organizes various events to create awareness on cardiovascular diseases and encourages people to stay healthy. Various postures, greetings, wishes pictures and messages are circulated on this day. The theme for World Heart Day 2018 is yet to be announced. 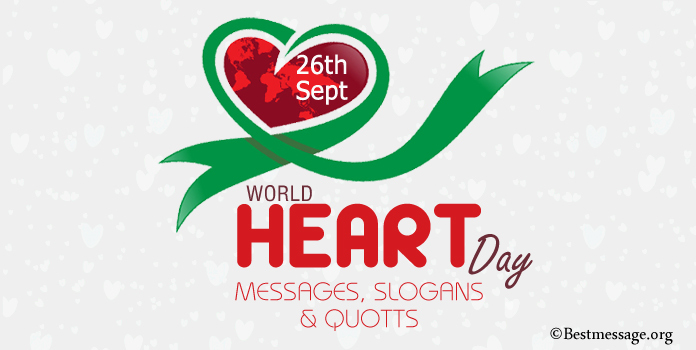 Sharing Save Heart slogans, heart diseases awareness quotes and wishes with family and friends is a way of creating awareness on this special day. Latest New Collection of Happy World Heart Day Messages and healthy heart quotes and saying in English is right here. Use these inspirational quotes about heart diseases to share via social media like Facebook, WhatsApp. 1. On the occasion of World Heart Day, I wish that your heart always stay healthy and happy…. So take care of your diet and always keep your heart in good shape!! 2. The best way to keep your heart in a healthy state is by eating right, sleeping right and not taking stress…. Sending my best wishes on World Heart Day to you. 3. If you have a healthy heart, you can enjoy a happy and long life…. So encourage your loved ones to go for heart checkup this World Heart Day for a smooth life ahead. 4. Let us celebrate World Heart Day by going for heart checkups and promising ourselves to eat healthy and live happy…… Best wishes on World Heart Day to you. 5. You live longer and healthier if you have a heart that beats without any complications. 6. A happy heart is a healthy heart…. Stay happy and live longer!!! 7. Life is more beautiful and more fun when you have a heart that beats right. 8. Don’t take your heart lightly because that is the basis for life. 9. Neglecting your heart is like neglecting your life…. If you want to life happily and healthy then take care of your heart…. Happy World Heart Day!!! 10. On the occasion of World Heart Day, let us take an oath that we will be more responsible towards taking care of our heart. 11. As we celebrate World Heart Day, remember not to break hearts but to win more and more hearts. 12. Each one of us have just one heart, so make sure that we take the best care of it….. Best wishes on World Heart Day!!! 13. Making a heart happy is the sweetest present to give anyone. 14. Healthy diet, regular exercise and happiness…. Perfect ingredients for a healthy heart. 15. Kill the stress and eat nutritious food and bid adieu to all the cardiovascular diseases. 16. Heartbeats are the rhythm of heart, let them play a beautiful song!!! 17. Eating right and keeping the heart light can help you live longer and happier….. Warm wishes on World Heart Day!!! 18. Make this World Heart Day more special by motivating more and more people to take care of their hearts. 19. If you are responsible towards your heart then you are responsible towards your family…. Happy World Heart Day. 20. Every heart is special, every heart needs care and love….. Best wishes on World Heart Day to you. Check the out other health related Post: Beautiful collections of National Doctor’s Day Wishes, National Dentist’s Day Messages and No Smoking Day.